In Cameroon, about 30,000 people who belong to the Baka Pygmy community live in the tropical forests of the country’s southeast. The Baka are hunter-gatherers, and the country’s mainstream educational system is inadequate for their unique way of life. Education officials are trying to find ways modify both the calendar and curriculum for Baka students, but progress is slow. FSRN’s Ngala Killian Chimtom traveled to the country’s Eastern Region and reports that the government is working with NGOs and the Baka themselves to develop a new approach to Baka education that better compliments their culture. It is break time at the government primary school in Boui, a small village in the Boumba and Ngoko Division of Cameroon’s South East Region. The building is a ramshackle structure, consisting of sticks pinned to the ground and roofed with thatch. The lone teacher here is preparing the next lesson, for second year pupils in this six-year school. Lisette Bakola is one of kids playing. She is a 12-year old Baka girl with high dreams, now in her third year, a level most students reach by the time they are eight. At another school in far off Ntam Carrefour, 14-year old third-year student Bernard Elinga nurses similar ambitions. “I would like to become some one important in life,” Elinga hopes. “Maybe a teacher, a soldier or a police officer.” But these dreams may never come to pass. 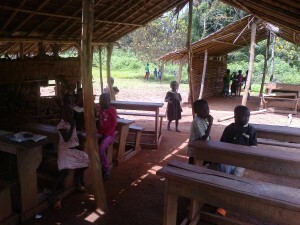 Almost all Baka children who enroll in primary school never proceed to the secondary level. A number of factors contribute to inadequate education for the Baka people including poverty, discrimination and an ill-adapted educational policy. Of the thirty Baka children who initially enrolled two years ago, Bernard Elinga is the only one still in the Ntam Carrefours’ school. All the others have dropped out to join their parents in their traditional Baka hunter-gatherer role. David Angoula, a Baka parent whose two sons left school to pursue this traditional role, notes that the Bakas have a school in the forest bequeathed to them by their ancestors. Angoula’s two sons are among the Baka men here chopping away at a huge tree with pick axes. As the tree gives way, women and children scurry to its trunk where honey bees have built a colony. With the help of smoke, they weaken the bees to harvest the honey. Collecting wild honey is just part of the daily routine of the nearly 30,000 Bakas. These are a hunter-gatherer people in the thick forests in the South East of Cameroon. They depend on wild fruits, honey, tubers and game for their livelihood. The Baka are so intimately linked to the forest that the trees, the animals and birds are an integral part of their daily existence. It’s this deep link between man and nature that has made attempts to introduce formal education to the Baka a long and convoluted process. Sarah Tucker, a consultant with the World Wildlife Fund, or WWF, says many Baka parents don’t see the benefits of modern education. “Sending a child to school and making them stay in school demands a lot of sacrifices for parents, you know, perhaps they can go into the forest and do their traditional activities, and so they don’t see a lot of the benefits of these sacrifices,” says Tucker. Still, the Baka are aware that for them to survive in a fast changing world, they need to acquaint themselves with modern education. But keeping children in school is a huge challenge for people who must frequently go out into the forest in search of food and medicine. The Cameroon government is working with partners like the WWF and the Baka themselves to craft an approach to make Baka Education successful. But, progress is slow. Both Heedge and WWF consultant Tuker say it begins with taking into consideration the Baka way of life. Officials plan to implement a new curriculum and calendar more appropriate for Baka students in December, but will efforts will be complicated by a lack of school facilities and teachers. And when reforms are implemented, it will still behoove the government to empower the Baka economically. Many here say they aren’t able to afford the ten dollars it costs to provide for their children’s school needs.